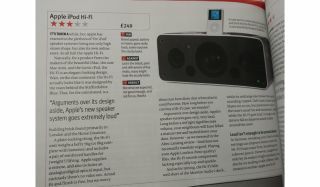 That Was Then... Apple iPod Hi-Fi review | What Hi-Fi? "It's taken a while". We could just as easily be talking about Apple's recently announced, clunkily named and late-to-the-party HomePod smart speaker, but back in May 2006 those were the first words of our iPod Hi-Fi review. And, in all honesty, it didn't get much more positive. The iPod Hi-Fi featured a 30-pin dock for your state-of-the-art 30GB iPod, could be powered by mains or batteries (adding to the iPod Hi-Fi's already significant 7kg kerb-weight), and came complete with digital optical and analogue outputs, plus a remote control. And it went loud. Very, very loud indeed. But "loud", as we observed at the time, "does not necessarily translate to good." And despite the tacit endorsement of the then-Prime Minister (the above photo appeared more than four years after our review, demonstrating the Camerons were determined to ignore expert opinion even back then), the iPod Hi-Fi went down as one of Apple's very rare failures. Virtually every 'Made for iPod' dock we tested at similar money outperformed it.